asparagus helps us get through the hard times of a gardener during which the garden requires a lot of work but you don’t get anything in return. there is a remarkable collection of asparagus recipes here on this blog. so take advantage of the archive and enjoy. but there is more – it seems there are endless fantastic asparagus creations out there. and here you will find one more. ragout with white asparagus and morels. a couple of years ago i cooked something like this with my best friend and it was delicious. but unfortunately i have no idea where we found the recipe back then. what i discovered in all my unsorted paper recipe archive (long before the digital times) was this version of asparagus-morels ragout which goes with some peas we luckily still had in our freezer. it was published in the german ZEIT magazine kochquartett and was inspired by anna schwarzmann. 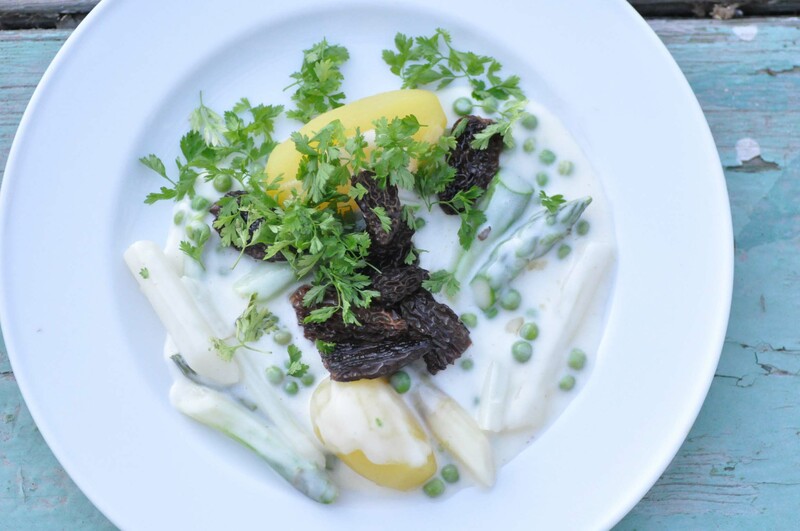 the morels add to this dish an intense flavor and are a welcomed contrast to the fine taste of asparagus and the creamy ragout texture. so go for it if you feel like offering yourself an alternative to sauce hollandaise. bring some salted water to a boil and blanch the peas. wash and peel the asparagus and cook for some minutes with a pinch of salt, a pinch of sugar and some butter. rinse with cold water and cut into 5 cm pieces. if you use fresh morels you have to clean them. if you have dried morels, you only have to soak them in warm water for about 15 minutes. in both cases you have to dry them carefully before you’re going to sauté them in some butter. add the sherry and bring to a boil. set aside. melt the 50 g butter in a sauce pan. add the flour while stirring continuously. add the asparagus fond and bring to a boil while you continue to stir. It will get creamy after a while. finally add the cream and reduce until the sauce begins to thicken. season to taste with lemon juice, salt and nutmeg. add the blanched peas, asparagus and the chopped chervil. serve the ragout topped with some of the sautéd morels and some more chopped chervil. serve with cooked potatoes and enjoy! gesalzenes wasser aufkochen und dann die erbsen darin blanchieren. den spargel waschen und schälen und dinge minuten mit etwas salz, einer prise Zucker und ein wenig butter bissfest kochen. anschließend mit kaltem wasser abschrecken und in 5 cm lange stücke schneiden. frische morcheln putzen – getrocknete ca. 15 minuten in warmem wasser einweichen. in beiden fällen vorsichtig trocknen bevor die morcheln mit etwas butter in der pfanne sautiert werden, bis sie weich sind. mit dem sherry ablöschen, aufkochen und zur seite stellen. die 50 g butter in einem kleinen topf schmelzen, das mehl hinzugeben und unter ständigem rühren einmal aufkochen lassen. den spargelfond angießen und weiter rühren bis die sauce beginnt sämig zu werden. die sahne zugießen nochmal ein wenig köcheln und reduzieren lassen. mit zitronensaft, salz und muskat abschmecken. die blanchierten erbsen, spargel und kerbel dazugeben und auf tellern anrichten. jeweils morcheln und etwas gehackten kerbel jeweils auf das ragout geben. This entry was posted in recipes, spring and tagged asparagus, peas by The Cook. Bookmark the permalink.